Article text volume, including annotation, reference list and all additional materials should not exceed 30 Mb. Entire article text font – Times New Roman, size – 12, margins – 2 cm on all sides, indent – 1.25 cm. Article title is to be centered in the bold font and with the capital letters. • the spacing is one and a half in article titles, information about the authors, article body text, lists of reference materials. Author credentials are to be presented in the following order: initials (without spacing in between) followed by a surname (in semi-bold type) and the name of the institution and postal address of a place of work on the next line in the following order: country, city code, city, street (to be typed in italics). A digital index should be affixed to each surname and corresponding institution in case of several authors. The name of institution should be indicated once, if all authors of the article work in the same institution. In case an author works in several places, each place of work is to be indicated by a separate digital index. The contact electronic mail address of the author responsible for the correspondence with the editors should be placed along with the date of receipt of the manuscript to the editor’s office. All listed elements should be centered (See Article Title Design Sample). Annotation should reflect the article content in brief. The structure of the annotation that repeats the structure of the article and includes the relevance, purpose, materials and methods, results, opinion (conclusions) is required for the original articles. The volume of text annotations is 100-300 words. Keywords: not more than 10 words or phrases to be typed in italics. Article structure. The structure of the original articles should follow the format: introduction that reflects the state of the issue at the time of writing; goals and objectives of this study; materials and methods; results and their discussion; conclusion. Section titles are provided: MATERIALS AND METHODS, RESULTS AND DISCUSSION, CONCLUSION, ACKNOWLEDGMENTS, LIST OF LITERATURE, REFERENCES (capital letters, center alignment, semi-bold font). Decimal separator is a dot in the text as in tables, figures and other applications. If symbols such as ×, μ, η, or ν are used, they should be added using the symbols menu of Word in Times New Roman font. Degree symbols (°) must be used from the symbol menu, not superscripted letter o or number 0. Multiplication symbols must be used (×), not the letter x. Spaces must be inserted between numbers and units (e.g., 3 kg) and between numbers and mathematical symbols (+, –, ×, =, <, >), but not between numbers and percent symbols (e.g., 45%). Please use SI units. All abbreviations and acronyms should be defined at first mention. Any Latin terms such as et al., in vitro, or in situ should not be italicized. Latin names of genera and species are given in italics. Citation: surnames are indicated in parentheses in the text reference (Petrov, 1998). The listing of a number of authors, references are given by seniority (by years) and separated by a semicolon (Ivanov, 2010; Kuznetsov et al., 2016; Pizl et al., 2017). References to the works of one author of different years are separated by a comma (Kuznetsov, 1988, 1999, 2017). The works of one author of the same year are quoted with the use of letter characters (a, b, c, etc.) after a year (Markov, 1963a, 1963b, 1963c). In case of an e-link, the initial word (words) of the source name should be indicated with replacement of the remaining part of the name by ellipses and the indication of the year of the data entry or updating (Catalog …, 2006.). Illustrative materials are presented in .tif or .jpg formats (at least 300 dpi) for photos, figures. Both black and white and color drawings are accepted. The illustrations should be placed in the text and also attached as separate files. All illustrations (photographs, charts, diagrams, graphs, etc.) in the text should be referred to as figures. All figures in the text should be provided with references (Fig. 1). The figures should be located immediately after the first mention in the text. The name should be provided directly below the figure with the dot not to be put after the name; centered. Notes to figures should be placed after the figure itself using the single spacing. Notes: *- 0.05 p-level variables. The figure text is provided as a separate list at the end of the article and should contain an exhaustive comment to the figure. If the figure consists of several parts (for example, a, b, c), they should have a common title and separate explanatory notes for each part. Tables. The number and name of the table should be placed directly above the table in one line (the numbering is required upon the presence of several tables; the number is not indicated upon the presence of one table). No dotting after the name with the right alignment. The tables are placed both in the text and should be attached as separate files. References to the tables should be given in the text of the article (example: Tab. 1). Empty columns are not allowed. Conditional abbreviations and symbols should be explained in a note. The table notes should be placed after the table itself with the single spacing. The financial support information (fund name and project number) is given after the body of the article. The authors are responsible for correctness of data given in the reference list. The reference list is compiled in the alphabetical order and not numbered by the names of the first authors and the titles of their works. Journal articles: Journal titles should not be abbreviated; the whole name of the journal should not be given. Bankert R.L. Cloud classification of AVHRR imagery in maritime regions using a probabilistic neural network // American Meteorology Society. Journal of Applied Meteorology.1994. Vol. 33. No. 8. P. 909-918. Gunduz E., Saygı Y., Yıldız Demirkalp F., Cağlar S.S., Atasağun S. et al. Seasonal composition and population of Lake Karaboğaz from the Kızılırmak Delta (Samsun, Turkey) // Turkish Journal of Zoology 2013. Vol. 33. No. 5. P.544-553. Astafurov V.G., Rasskazchikova T.M., Skorokhodov A.V. Interpretation of remote satellite remote sensing visual data // Izvestiyavuzov. Fizika.2012. Vol. 55. No. 3.P. 77-83. (In Russian). Vasil’ev A.V., Mel’nikova I.N. Experimental models and the Earth surface. Saint Petersburg: Izd-vo BGTU “Voenmekh”, 2010. 226 p.
Stepanov O.A. Design peculiarities of the satellite navigation system / Integrated inertial satellite navigation system. Petrov D.S. (ed.) Saint Petersburg: Elektropribor, 2001.P. 25-43. Armand N.A., Tishchenko Yu.G., Savorskii V.P., Smirnov M.T., On science program of space experiments of the MKA-FKI (PN1) project) // Fundamental Space Research. Recent Development in Geoecology Monitoring of the Black Sea Area and their Prospects: Proc. Conf. 22-27 September 2008. Bulgaria, Sunny Beach, 2008. P. 31-34. Novik S.N. Study of interaction of electromagnetic radiation with forest canopy. Candidate’s phys. and math: PhD. Tomsk: TGU, 2007. 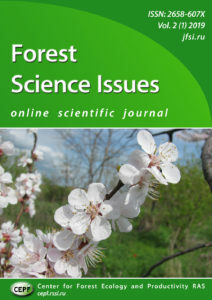 197 p.
Manuscript submission form: Materials of articles should be presented only in the electronic form by filling in the fields at http://jfsi.ru journal website after logging in. Publication of articles is free.